Happy Friday! This week has been a little strange over here. I've been kind of sick and we have been dealing with a family crisis on my stepmom's side of the family. A little crazy, but everyone is getting through and I'm finally starting to feel better today. Thankfully, it should be a nice, sunny weekend, so that I am definitely looking forward to that! In truth, when we ventured out to take these photos, it was one of the very few times this week that I actually bothered to put on real clothes and makeup. Sometimes it is nice to take a break from putting myself together, but it did feel nice to get out of the house and feel pretty! This dress is probably my favorite dress currently in my closet, if not my most favorite dress I've ever owned. 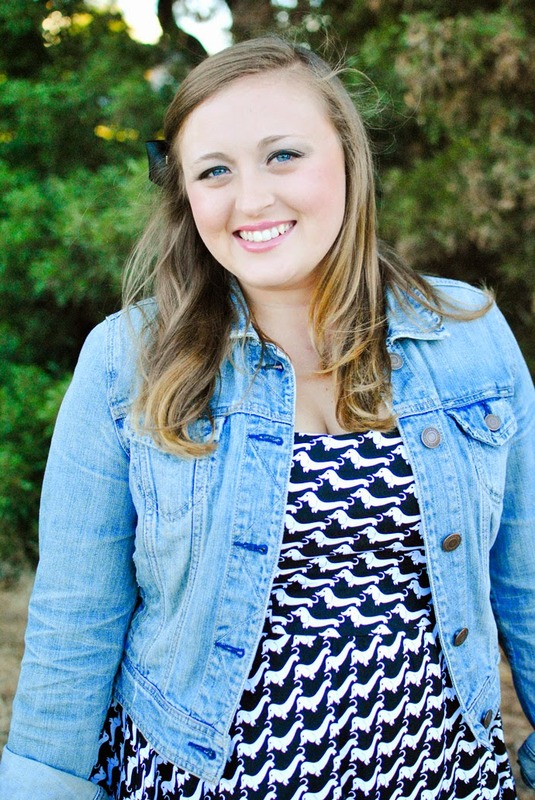 I bought it on ModCloth last year when I was searching for a black & white dress to wear to my dad's wedding. As soon as I slipped it on, I was smitten and there was no going back! To me, it is just the most perfect fit and the most perfect print. I should have gotten a few photos with my jacket off, but it is sleeveless and has the most perfect shape to it (can you tell that the theme here is that it is perfect?). It flares out just so and fits me wonderfully in the bust. Not to mention, it has little dachshunds on it. Yep, that's the huge selling point for me. 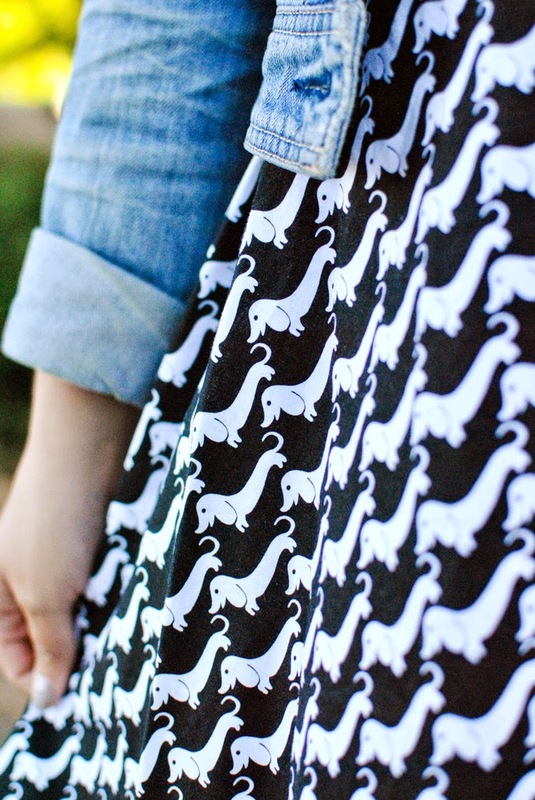 IT IS A DRESS WITH DOGS ON IT. It is like an ode to my little dachshund! Another thing that is wonderful about this pattern is that it doesn't actually look like a dog print from far away. It just looks like a cool black & white pattern, but when you get close up, you can see the little pups! My dad actually hated this dress at first and kind of begged me to get a new one for his wedding, but when he saw me all dressed up on the day of and saw how many people thought my dress was awesome, he told me I was right. So, there you go! I can't forget to mention these shoes as well! I just bought them last month, and specially broke them out for the first time to wear with this dress. They are such a fun color and are unlike anything I own. I thought it would be nice to have a pair of little heels that are more summery feeling, and that are heels I will actually wear! 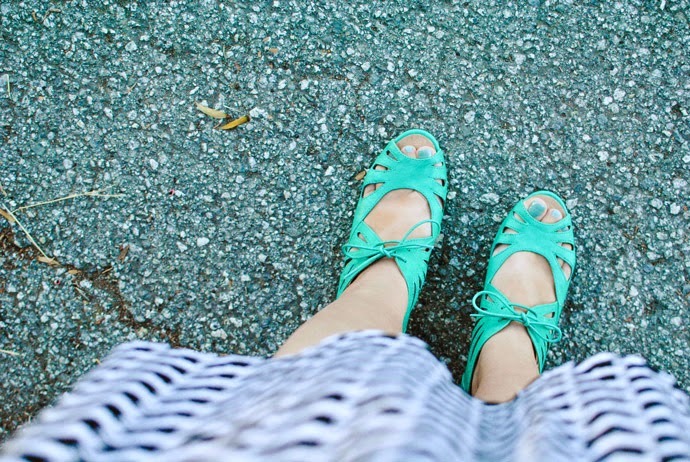 I don't like my feet to be uncomfortable, so I generally only wear heels on special occasions. But these... Oh these are magical. They are wonderfully easy to walk in, are cushy, and just the best. Plus, they have a great vintage/retro vibe to them and are so classic looking. I have actually been eyeing Chelsea Crew shoes for quite some time, coveting pairs for months, but never taking the plunge (there's still a pair I can no longer find anywhere & still regret not buying!). I am so happy I decided to go for it with these beauties and am excited to add more Chelsea Crew items to my collection. Well, friends, I'm off to do a little baking and give myself a manicure with the free Maven box I got from Julep! I love getting fun mail and was excited to see all the little goodies in my box. Can't wait to try their products out! Also, I don't usually bake. Like at all. I don't have the patience for it and generally don't follow the directions perfectly, which doesn't always work in my favor! But, I've had more time and have found myself wanting to bake. I made a peach crisp the other day with peaches we got from fruit picking (peeled them myself and everything!) and it turned out to be so yummy. After that success, I've now had the idea of making chocolate chip oatmeal bars on my mind all day. It's a little scary that I've been wanting to be so domesticated this week. So unlike me! Oooh this is the most perfect dress! Also the most perfect name for the outfit pictures. I think its such a fun pick for a wedding! I also just ordered my first Maven box so Im excited to see what goodies I get. What an awesome dress! You're right, I couldn't tell they were dachsunds until the closeup photo, I just thought it was a really cool abstract print. 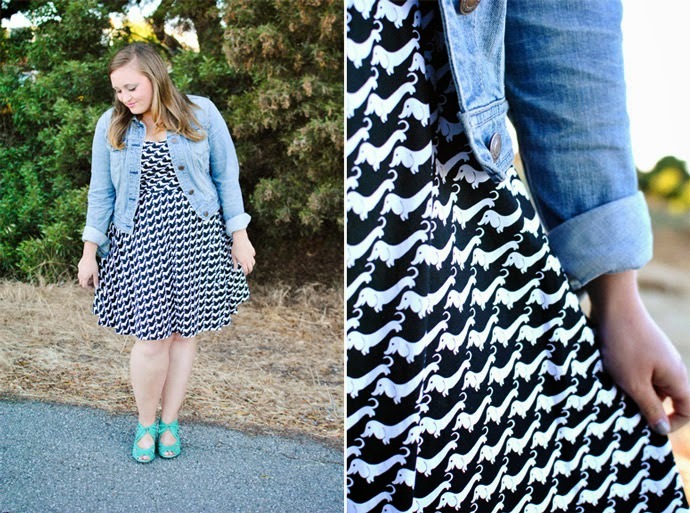 It looks great with the jean jacket, and those shoes are a dream! I'm really glad to have found your blog :) Enjoy your weekend! PS Crazy to hear you witnessed someone jumping in front of the train. I can't even imagine!!! Just shakes you to the core! 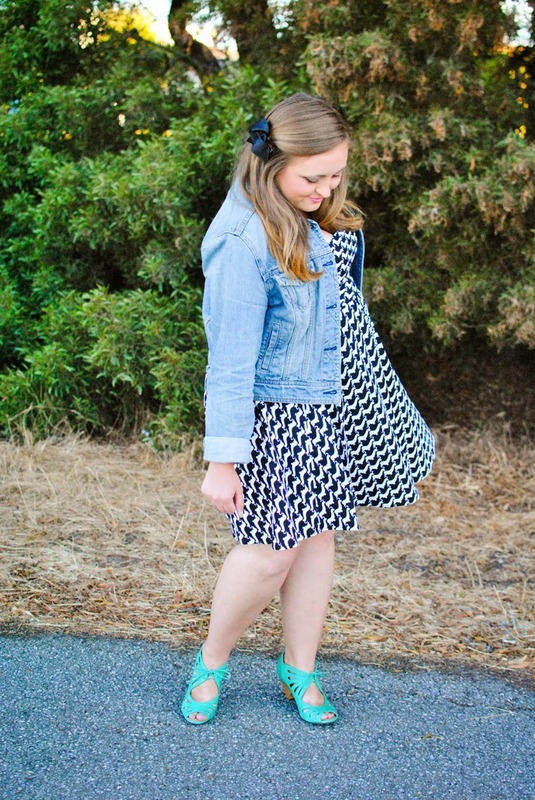 That dress is super cute, and it goes so well with those shoes! I hope things get better with your family. Love the shoes so much, Jess! The dress looks perfect on you as well, and I agree from the distance I couldn't see the dogs on it :-) Double print! Sorry about your family crisis....you could have fooled me though with your beautiful smile! I need to raid your wardrobe Jes! That dress is KILLER and I need it, one I love B&W and two I love dogs. Wonderful! And I love the shoes, can't believe those are from DSW! Super cute! Haven't been there in years....I guess they have cute stuff again! Thanks, Isabella! 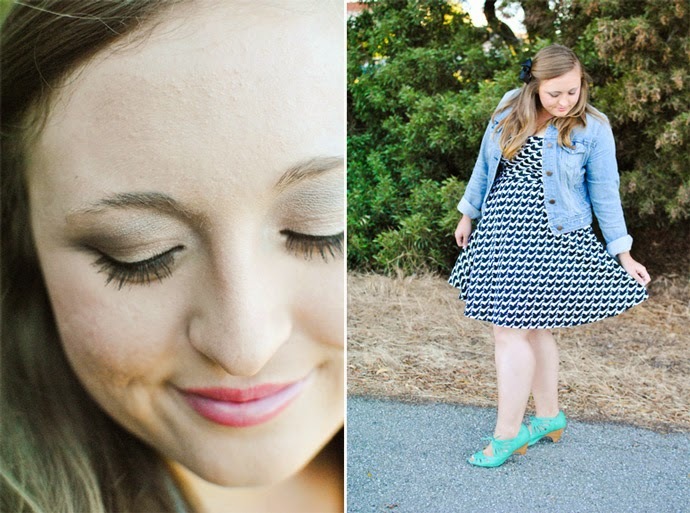 Those shoes are definitely my new favorites :) Thanks for stopping by and I'll be sure to check out your blog as well! 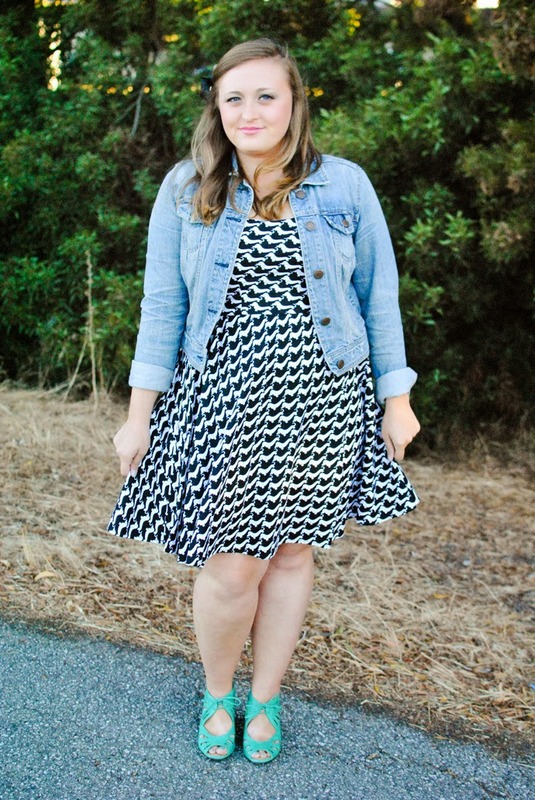 You're right, that is so very ModCloth! Partly why I love that company :) You can always find such unique things there! Aww thanks! It's my stepmom's family, so I'm not really involved much, but I see how it affects her and the close family and that's a little tough. Just trying to be helpful to them wherever I can! We should like swap clothes or something! 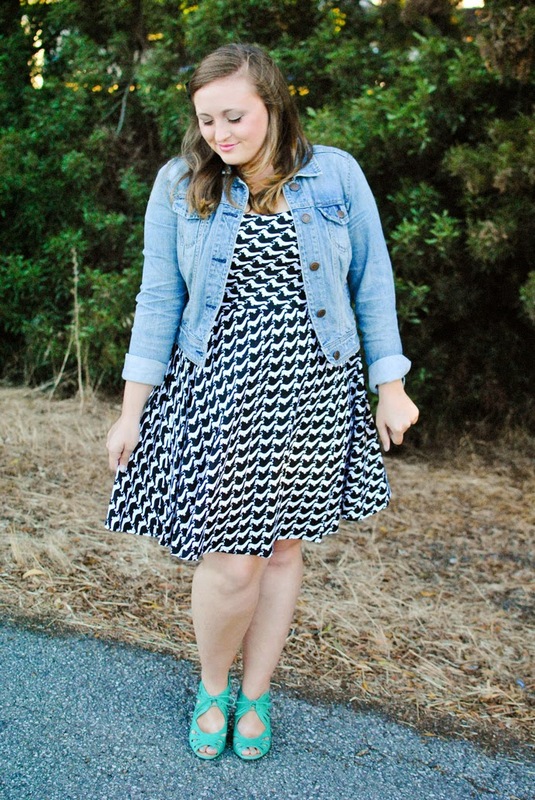 That could be fun :) Go to ModCloth and order one of these dresses! It is just so fun! I really love shoe shopping at DSW, especially since they have so many pairs and I could spend a lot of time there. They do have additional things online that aren't sold in stores, which is how I found these shoes! Also, with that train thing... It was definitely crazy, but I am really thankful that we got there when we did, because if we had come just a minute earlier... We would have actually seen it happen (not just the immediate aftermath) and I don't know if I could have handled that! It is also crazy that this family stuff kind of has to do with something similar. Scary.